This new watch is created by Timex and acts as more then your average watch. Built-in functions that can be found are an altimeter, barometer, thermometer, chronograph, alarm and compass. 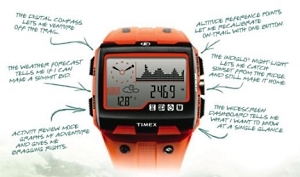 The Timex Expedition WS4 is water resistant down to 50 meters. The strap is rubber on the standard version although the watch can be used with a fabric strap making it a lot more secure for demanding situations. The LCD screen is lit by Indiglo giving it an easy read screen for dark times. Several colours of this watch will be made available at a cost of $200.